2019 Tour de France Cycling Holiday - Bordeaux to Barcelona via the Pyrenees and Tour de France! See the Tour de France! Ride the Pyrenees! Tourmalet, Peyresourde, Aspin, Hautacam, Aubisque. 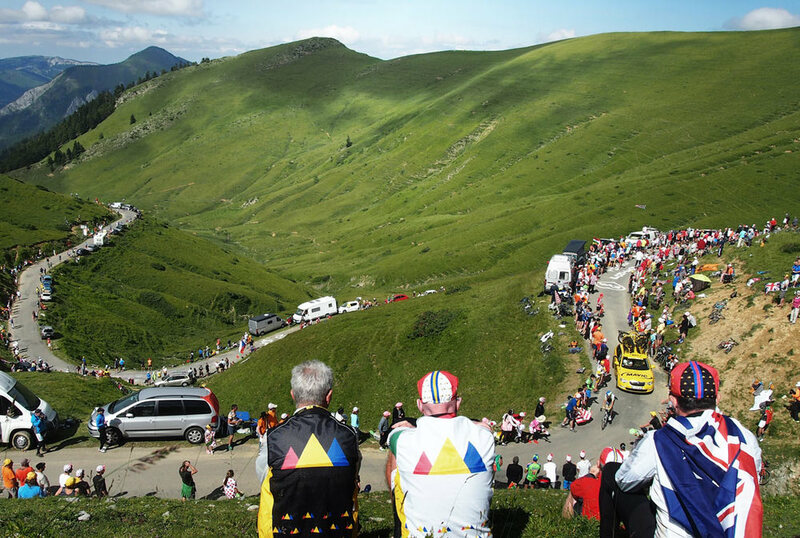 Climb the famous cols of the Tour de France. Cycle in southern France and Catalan Spain. Cycling Holiday of a lifetime! This ride is rolling & mountainous. Arrive with a good level of fitness with climbing/hill training. Click here for full tour inclusions and costs. OUR RIDE BEGINS IN BORDEAUX, EASILY ACCESSIBLE WITH MAJOR AIR AND RAIL LINKS THROUGHOUT EUROPE AND THE WORLD. Options include a direct flight to Paris (21 hours from east coast Australia) followed by TGV (fast speed rail) from Paris airport to Bordeaux centre in 4 hours! Contact us for advice & we can pass you on to our recommended travel agent if you are interested. *Please note that the route may change slightly pending accommodation bookings. We ride out of Bordeaux along the Garonne river to the walled town of Cadillac for a morning coffee stop. We cycle through the rolling vineyards of the Sauternes wine region, known for its famously sweet wines. Our overnight stop is in Bazas, where we enjoy a welcome group evening meal. Another relatively flat day on the bike to warm the legs up. We cycle through rolling farmland and stop for lunch at La Bastide d'Armagnac, a beautifully preserved medieval bastide town. We visit the Chappelle Notre Dame des Cyclists, honouring greats of the Tour de France. The region is also famed for its gastronomy, with opportunities to taste local specialities of foie gras and armagnac brandy. Today we ride in to the foothills of the Pyrenees. We cycle through small rural villages and tackle our first short climbs of the trip to get our first views of the Pyrenees mountain range. Our overnight stop is in the pretty mountain village of Laruns, where we enjoy a group meal of traditional mountain cuisine and local wines. Today we climb the famous Tour de France climb, the Col d'Aubisque (1709m). It's a 17km climb from Laruns and the scenery is spectacular! We descend via the Col de Soulor. Mountain goats amongst us also have options to climb the Hautacam today. We stay for 3 nights in a pleasant mountain village close to Argelès Gazost for 3 nights to see the Tour de France. We have three nights and two full days in Saint Savin, a beautiful mountain village in the heart of the Pyrenees, from where we watch the Tour de France. The region is a cyclists paradise, surrounded by spectacular mountains and located at the foot of many famous Pyrenean climbs. The region will be buzzing with atmosphere and cyclists. On Friday 19 July, we will watch Tour de France Stage 13 - the Individual Time Trial in nearby Pau. This is the only ITT of the 2019 TDF and sure to challenge the riders, being placed between 2 Pyrenean mountain stages. It will give you an opportunity to get up close to the riders & team cars and experience the thrill of the "contre -la-montre”. Stage 14 on Saturday 20 July is the Queen Stage of the Pyrenees, taking the riders to a mountain-top finish on the famous Col du Tourmalet (2115m), a gruelling Hors Categroie climb. We will be up close to the action, cheering the riders on as they battle it out on the slopes of the Col du Tourmalet. For those of you after an easier day, the Tour Caravan and Peloton will pass only a few kilometres from our hotel. During our stay in the region, you may also choose to relax at our hotel or tackle some optional climbs nearby including the Hautacm, Cauterets or Luz Ardiden. There are also some beautiful valley rides if after an easier option. Today we ride undoubtedly one of the most famous cycling climbs in the world - the Col du Tourmalet. From Luz St Saver, this hors categorie climb is 19km long with an average gradient of 7.4%. It's an epic climb, and will be exciting to ride it the day after the Tour has passed through. After a sweeping descent through ski-villages we stay in the Adour valley. For those after more - we are close to the Horquette d’Anzican, which will feature in Stage 12 of the 2019 TDF 2 days prior. Today the spectacular mountain scenery continues, as does the famous climbs. While it’s a short day in kilometres, there’s plenty of up and down. First we conquer the Col d’Aspin (1489m), with spectacular mountain views. This is followed by the Col de Peyresourde (1569m) with it's awesome hair-pinning descent to Bagneres du Luchon. "Luchon" is a cosmopolitan spa-town, celebrated for its thermal springs and pleasant tree-lined central avenue with shops & restaurants. We depart Luchon climbing the wooded Col de Portillon, crossing the border in to Spain! Hola! We are in the Val d'Aran (Aran Valley), and have a final short climb along the valley to our overnight stop in Arties, a pleasant hillside village surrounded by 2000m high mountains. It may be a short ride, but there’s ample climbing a fantastic tapas bar near our campsite that deserves plenty of attention! Today we climb along the Aran valley, where stunning hairpin bends take us to the mighty Port de la Bonaigua (2072m). It's a sweeping 30km descent beside the river Noguera Pallaresa, meandering through rocky gorges to Sort. OUR ROUTE TRAVERSES THE PYRENEES, CROSSING THE MOST BEAUTIFUL & WELL KNOWN CLIMBS OF THE TOUR DE FRANCE AND VUELTA A ESPAÑA. We depart Sort and climb the Coll dell Canto, also known as the Port de Canto. A picturesque climb, it starts with a twisting ascent, with gradients of 6 to 7% before levelling off and offering stunning views of the Sierra del Cadi mountain range. The descent to La Seu d'Urgell is fast and spectacular. La Seu d'Urgell is famed for its fine cathedral and markets. There are some fantastic restaurants and tapas bars and Andorra is only 10km away. Today we are on quiet mountain roads through the Sierra de Cadi mountain range. The countryside has a remote and isolated feel, nothing but ourselves, the roads and the mountains. We pass over the Col de Port and descend to the medieval town of Solsona, with a maze-like old town and gothic cathedral. Today's ride has options for more/less climbing and we finish the day with a special group meal sampling Spanish wines. We are riding through quiet rolling countryside, passing through small villages as we approach the spectacular rock formations of the Montserrat massif. The highlight of the day is the mythic climb to the Montserrat monastery, with breathtaking views across Catalonia and to the coast. We stay overnight in one of the Monastery buildings and enjoy a group meal together in the evening. Our final day of an epic ride from the vineyards of Bordeaux across the Pyrenees to arrive at Barcelona! We roll through forested hills to arrive at Tibidabo lookout, high above Barcelona with birds-eye views of the city skyline, punctuated by Gaudi's Sagrada Familia and the Mediterranean! We descend to arrive in the heart of one of the world's most exciting cities. It's a spectacular city to finish our journey and we celebrate with a group meal. Our hotel is located in the centre of town, close to the famous Ramblas, Barri Gotic (Gothic quarter), Gaudi's famous creations, the Picasso museum and a short walk from Barceloneta and the beach. On Monday the 29th of July, you need to organise your own onward travel arrangements from Barcelona. Barcelona has an international airport with flights to European destinations and the rest of the world including direct flights to Australia. There is a major railway station with fast-speed rail connections throughout Europe. Or why not join us for our Milan to Venice ride for an epic month long cycle holiday!? We can transport your bike and will provide you with travel advice to connect Barcelona and Milan. TOUR COST IS AUD $5350 per person, twin share. EITHER a DEPOsit by BOOKING ONLINE or by CONTACTING WOR to arrange an EFT.